It is is 10 years since the US subprime bubble began to burst, with disastrous results for the US and global economy. Yet US housing starts have never returned to the 2.0 – 2.3 million/year level seen between 2003 – 2006. Last month, they were just half this level at 1.1 million/year. Housing therefore represents an excellent example of the importance of demographics in driving demand, rather than monetary policy. Since 2008, the Fed has taken interest rates to their lowest level in history, and printed money at an extraordinary rate, in order to create consumer demand. Homeowners making moves out of state are increasingly selling out of expensive markets like California, where price escalation is steep, and buying into lower-cost markets such as Texas and Arizona. Overall between 2000 and 2015, 2.5 home sellers left California for every out-of-state buyer coming into the state”. The US housing market thus confirms the profound changes taking place in Western demand patterns. It also highlights the risk of believing that the Fed is able to guide developments in its preferred direction. Or, indeed, of believing that the Fed has a good grasp of what is actually happening in the real economy. US housing starts are slowing so far this year, with February’s starts just below the million level again on an annualised basis. 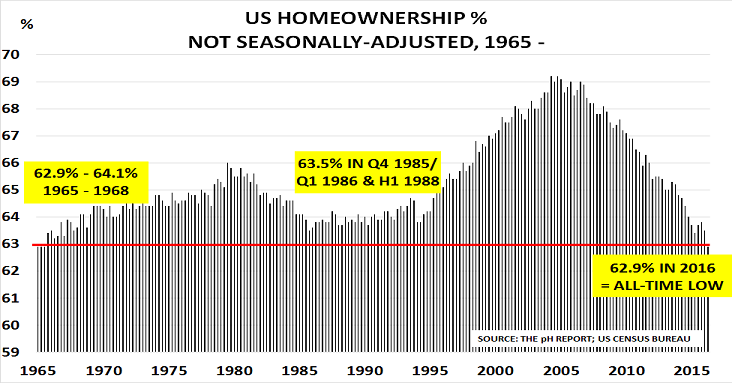 This follows the steadily declining rate of home ownership, which is now back at 1995′s level of 64%. And yesterday’s Case-Shiller report on home prices suggests the 10-City Index may well have peaked back in August. 2007 was the worst year in the early period. But it still managed 1.4 million starts and 16m auto sales. 2014 was the best year in the later period, but starts were only 1m, although auto sales matched the 16m level. And the best year since 2000 was in 2005, which saw 2m starts and 17m auto sales. 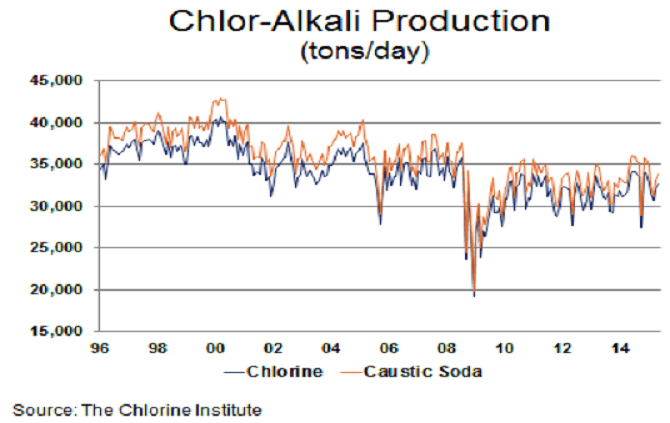 Both markets are critical to the US economy, and to the US chemical industry. The average car uses around $3.5k of chemicals, and the average new home around $15k, according to American Chemistry Council data. Yet cars that are sold on 5 1/2 year leases won’t be replaced until the year 2020. And building multi-home apartment blocks typically requires only half the materials of a single home. This weakness, combined with the impact of the oil price collapse, is confirmed by the Atlanta Federal Reserve’s new GDP Now index, as the chart shows. This aims to provide a real-time snapshot of US GDP. It was registering Q1 growth of just 0.2% on Monday. US housing markets will never be the same again. That’s the conclusion of a new analysis by the blog for ICB. 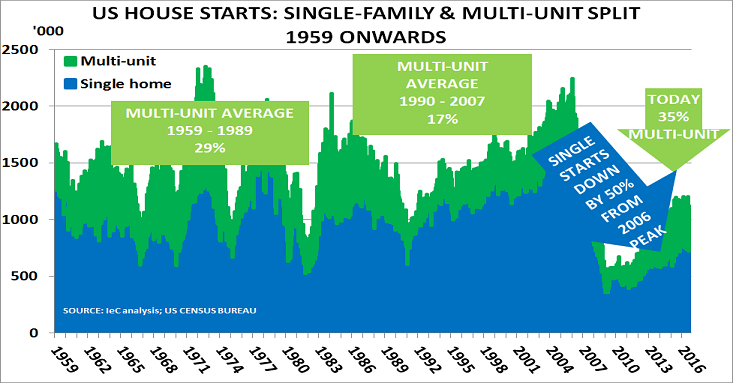 So demand suddenly switched from multi-family apartment blocks to single-family homes. And people needed to buy plenty of new cars so that they could get to work and provide a taxi service for the kids. Large out-of-town shopping malls were also essential, so you could fill up the car at weekends with everything you would need for the next week. But now those days are over. Not only were fewer babies born after the Boom, but fertility rates have halved since 1955, to just 1.7 babies per woman. Instead, the key demand driver is the aging population. Home ownership rates are in long-term decline, back at levels last seen in 1995. So demand for suburban housing is never going to be the same again. Driving habits change with age, and as people get older, so they drive a lot less. Equally important is that city centres are now becoming increasingly attractive as places to live. As a result, a ‘flight back to the cities’ is well underway. None of this is rocket science. But we seem to have got out of the habit of thinking about people as being the centre of demand. Yet we all know older people, maybe our parents or friends or work colleagues. All we have to do is to apply the learning from our own knowledge to understand what the future holds. Please click here to download a free copy of the new ICB article. And please click here to view the YouTube video interview with ICB deputy editor, Will Beacham. Suppose, for example, they loudly and consistently announced that the US was now in full recovery mode, and would be certain to achieve economic growth of 3% or more? And that then, growth actually turned out to be minus 1% in Q1? Would that make them look again at their theories? This of course is what happened last week. And so we know policymakers’ answer to the blog’s question. Just as feared in April, they chose instead to ”blame the downturn on the weather”. Yet Canada had just as cold a winter, and managed GDP growth of 1.2%. “An unexpected slump in the US housing market has exposed the shaky fundamentals of recovery in the world’s largest economy, as a lack of incomes growth for middle-class Americans leaves them struggling to buy a home. Thus the blog scratches its head, and wonders what it would take to convince policymakers that it is impossible for an ageing society, like the US, to return to growth levels seen when the population was in its prime wealth creation phase? US housing markets have been a disaster for many homeowners. Overall, they have lost $6tn since the collapse began in 2006. Nationally, prices are still down 32% versus their peak, according to the Case Shiller Index. On the more positive side, housing starts has begun to improve, as the chart shows. They jumped to 872k in September, with building permits also rising to 894k. These are easily the strongest numbers since the crisis began. But the buyers are mostly not ordinary Americans seeking to buy a new home. Instead, the money is coming from investors seeking to rent out property to those now unable to buy. Many are private investors, buying locally. But private equity funds have already raised $7.2bn. The driver, as Pimco (the world’s biggest bond fund managers) note, is that at least another 4m Americans will need to move into the rented sector, as foreclosures continue.